Apples have always been a favorite fruit of mine. There’s so many varieties, they peak in fall (my favorite season), they are readily available year-round at very affordable prices, and they’re packed with soluble and insoluble fiber. Apples are commonly used in sweet and savory dishes, making them all the more versatile in recipes of all types. I also love that they’re great solo and easy to eat on-the-go, unlike melon, oranges, etc. Dogs, I’m convinced, all love apples, too. Any dog I’ve ever known has LOVED apples. 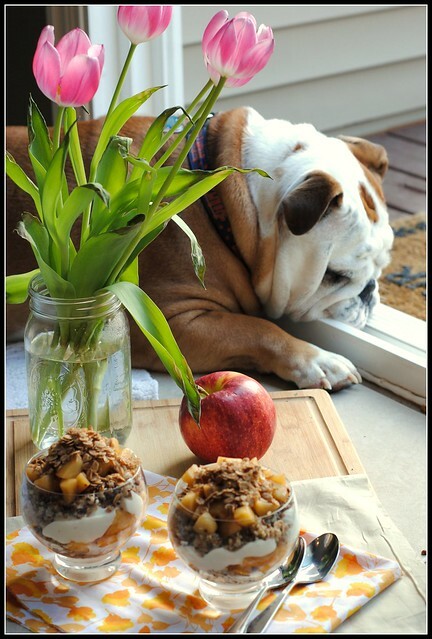 Wags, my childhood family dog, LOVED apples – they were by far her favorite food. My dear Lily feels much of the same. And let me tell you, my dog won’t eat many fruits or veggies, but apples, pineapple, and tomatoes are always a sure bet. She was sure to stay close to the action during this shoot…as you can see above. This particular recipe simmered apples and cinnamon to a sweet, syrupy perfection. 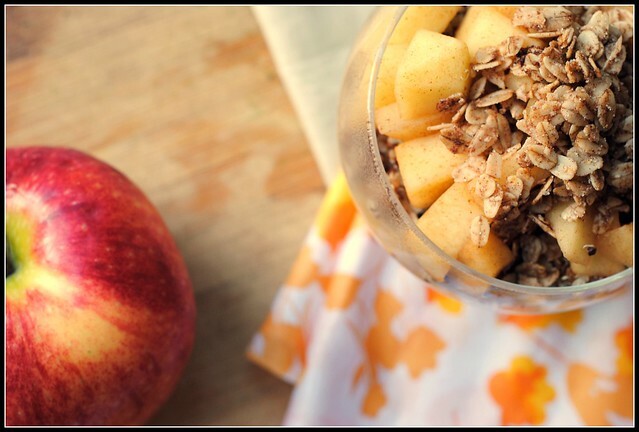 You then layer cinnamon-flavored, protein-packed quinoa and Greek yogurt for a Cinnamon Apple Quinoa Parfait that is beyond drool-worthy. The day I made these I had one for breakfast and dinner. When I walked into class with my little parfait, all of my students wanted to know what I was eating. I got a few weird looks, and a few “ew’s”, as well as few, “That looks good!” The later comments were the accurate ones – I was seriously impressed with these parfaits. Clearly, they were good to have comprised two meals in one day. Between the nearly 18 grams of protein and 9 grams of fiber, these parfaits are a smart start to any morning with a lot of staying power. 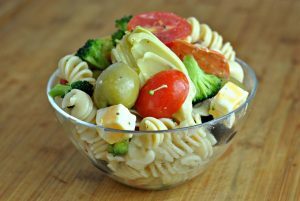 In other words, don’t shy away due to the 418 calorie price tag – these are well-spent calories that taste great and pack lots of nutritional punch. I was able to make each (very simple) component ahead of time and assemble the following day. Once assembled, these parfaits stayed good in the fridge for 3 days…not that they’ll last that long! In a medium saucepan over medium heat, combine all ingredients for the apple compote, mixing well. Bring to a boil and reduce heat to low. Partially cover and cook until apples are softened and liquid is syrupy, about 10 minutes. Add more water if needed in the cooking process. Take off heat and let cool completely. Cook quinoa according to package directions. Stir in cinnamon. Set aside to cool. Combine all ingredients for the crumble in a small bowl. Spread evenly on a baking sheet and bake until golden brown, about 7-10 minutes. Set aside to cool. 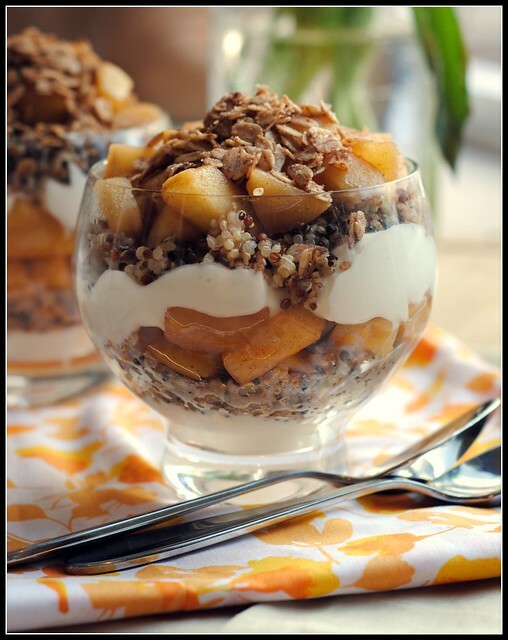 To assemble, spoon 1/4 cup yogurt in bottom of a bowl, 1/4 cup quinoa, 1/4 cup cinnamon apple compote into each of 4 bowls. Repeat the layering and top with oat crumble. Yield: 4 large parfaits (about 1 3/4 cup each). Result: Do not fear, this recipe is 100x easier than it looks. You can make every component of these parfaits ahead of time. I assembled all 4, ate one, and packed the rest to take as breakfast for the week. And let me tell you, what a breakfast. These things are packed with good-for-you nutrition, fiber, and protein that will keep you going ALL morning long. I reduced the amount of crumble by half, but kept the rest of the recipe the same. As someone who’s still not 100% sold on quinoa, I LOVED this breakfast parfait. Enjoy! I am finally recovered from that late-night hockey game on Sunday. It’s expected to be another hot, sunny day in Ohio. Everyone keeps asking if I’ve been tanning and nope…just lots of running, yard work, and enjoying the evenings on the deck…getting my vitamin D. 🙂 Love it! 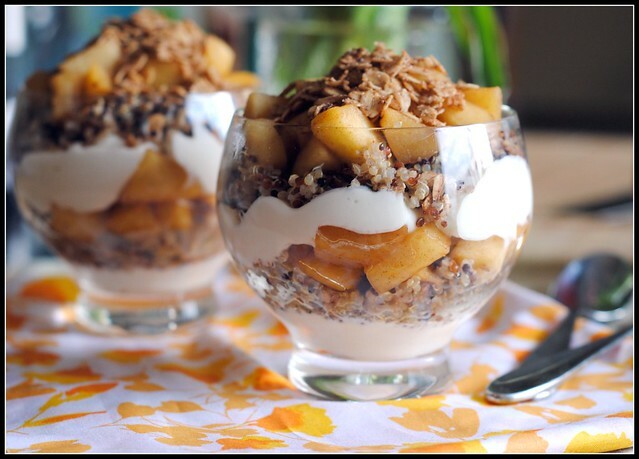 Love the idea of cinnamon apple on top of this yogurt parfait with whole grain goodness. Wow this looks so good!! I love the idea of putting these together, especially since both yogurt and quinoa were listed in Self magazine’s superfoods. Thanks for posting! lol, someone asked me if I’d been tanning yesterday, and I laughed because I haven’t even really been out in the sun! I haven’t done the math, but I’d be willing to be I spend a good $15 on greek yogurt each week too. I eat two servings a day (and thankfully for our budget, nick hates it!). This looks great! I want to assemble it ahead of time like you did. How did you do it? Did you leave them in the cup, cover and refrigerate or freeze them? Thanks! I am also LOVING This weather…it’s insane!! Your recipe looks delish. I’ve tried making quinoa for breakfast before and it was a flop. I’m inspired to try again! Ps. The calorie content is perfect for a breakfast meal! I wish people would understand that (I know YOU do, but the fact that you even have to explain that is frustrating no??). I just saw a similar idea on Food52 with quinoa that had been toasted instead of cooked. Oh, and my dog goes nuts for apples. Yum! I love the dates in there…thanks, Sam! These look delicious! I’m not sure my dog has ever eaten an apple…But I wouldn’t put it past him. He eats a lot of broccoli. I always think you subconsciously choose a dog that fits your family. Dogs like apples? How weird, I’ve never seen anything outside of a horse eat an apple. But these definitely sound good. What makes it so unique is the addition of quinoa. Can’t wait to try this. I love, love, love Lily’s face! Our dog doesn’t like apples, but he loves watermelon – especially the rind! This comes in at 11 WW points, but with the balance of protein and fiber, I think I could manage that amount of carbs. Just have a low carb lunch and dinner afterwards! Love the protein power in these!!! Plus simmered and cinnamony apples are always a favorite of mine. $62 for groceries rocks Nicole! Looks and sounds amazing…as always! I had one boston who did not like apples, but my two current boston terriers love them, and they go NUTS over yogurt. I think they’d be hanging around if I made this also. Cute photos. These look fantastic! I’ve made breakfast couscous before, but not quinoa. I have a granola recipe that I love and think will pair well with this (instead of the oat crumble) so I totally can’t wait to try these soon! I love that photo of Lily so much, the rear no words to describe the cuteness!! I have a “princess” dog. He’ll only eat apples fresh from the tree. This looks amazing! I will be trying this soon since I just got a big bag of gluten free oats. p.s. you probably know this already, but did you know you can cook quinoa in your rice cooker? Same ratio as rice. It was like a ray of light came down onto my rice cooker when I discovered that! This is a great recipe, but shouldn’t full credit be given to Kate at Epicurean Mom? This looks like her original recipe word for word, you just used less oats and water….still in her words. Nancy, there are several adaptations, therefore I used the verbage that I did. Unless I follow a recipe verbatim without any changes in quantities or preparation I make note of that for everyone’s sake. 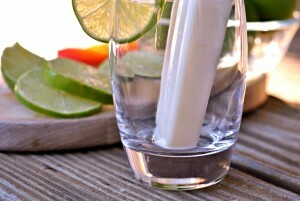 Oooh, I saw these featured on Healthy Food for Living and totally pinned it from the Epicurean Mom! I’m so making these. I’m definitely in the “that sounds good!” camp. Oh Lily… what a silly clown. I love her! And I love these! They look amazing, can’t wait to give them a whirl myself. I’m drooling just thinking about it. 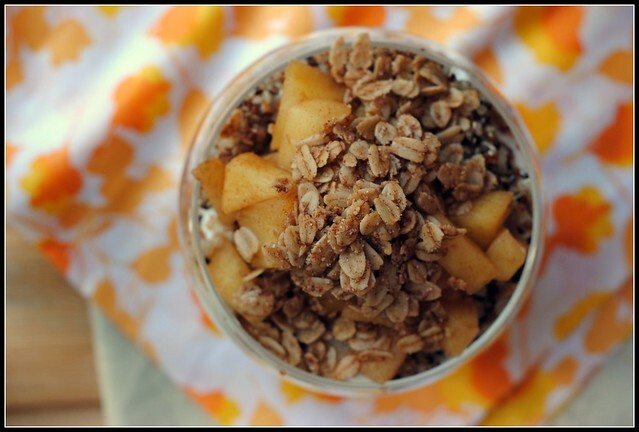 Is Cinnamon Apple Quinoa Parfait a GLUTEN free recipe ? Jan, if you use uncontaminated oats, yes…it is gluten-free.